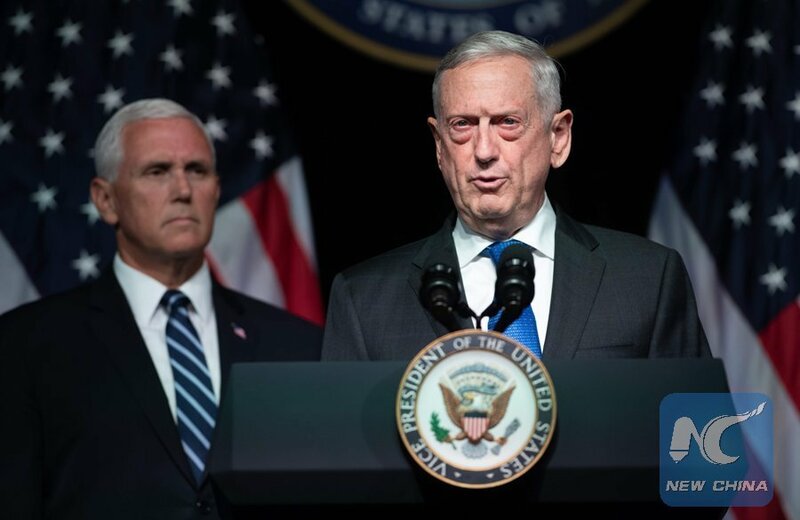 WASHINGTON, Aug. 9 (Xinhua) -- The Pentagon said on Thursday that U.S. Secretary of Defense James Mattis will embark Sunday on his first trip to South America. In a statement, the Pentagon said the tour, which would take him to Brazil, Argentina, Chile and Colombia, will underscore Pentagon's strong defense ties with these nations as the White House declared 2018 the "Year of the Americas." These relationships are critical to a collaborative, prosperous and secure Western hemisphere, it said. In Brazil, Mattis will meet with senior officials and defense leaders. He will also speak at the Escola Superior de Guerra, the country's war college, and visit the national monument to Brazilian service members killed in World War II. Mattis will then visit Argentina, where he will meet with senior defense officials to discuss defense issues of mutual interest. He will later exchange strategic perspectives with Chilean senior officials and then conclude his trip in Colombia, where he will meet members of the newly elected administration. As U.S. ties with the region have been at odds over immigration, trade, drugs and cross-border crimes, U.S. President Donald Trump in April skipped his first Latin America trip to stay in the United States to "oversee the American response to Syria." He had been scheduled to pay a visit to Peru and Colombia and attend the Summit of the Americas in the Peruvian capital city of Lima. U.S. Vice President Mike Pence replaced him to travel to the region instead.